My first TeachMeet was in Melbourne in 2014. Organised by Digital Learning and Teaching Victoria, it was held at a small pub in the back of Carlton. Although there were some interesting presentations on the use of Verso to provoke deeper thinking and another discussing the use of Genius Hour, these were not necessarily what I took out of the event. Rather, what I remember was the time spent putting a face to the name of those who I had connected with online and engaging in debate about topics such as cloud computing, traditional essays and maker education. What I love most about TeachMeets is the potential to test out ideas with others. From exploring digital literacy, questioning giving back, changing education and challenging the digital native myth, I have found presenting in a new context forces you to rethink your ideas, as well as opens them up to criticism. Through the feedback gained though, it has helped me grow both personally and professionally. Although we can have Twitter chats, organise a Hangouts or connect verbally via Voxer, none of these modes or mediums quite emulate the experience of connecting face-to-face. This is the strength of TeachMeets. Although the presentations are great to hear and it is always good in regards to perspective, the value gained is often found in the breaks where you have are able to connect with colleagues and collaborate. In today’s day and age, it seems odd when teachers restrict their thinking to the four walls of their own classroom. TeachMeets provide a great opportunity to reach out and go beyond this. 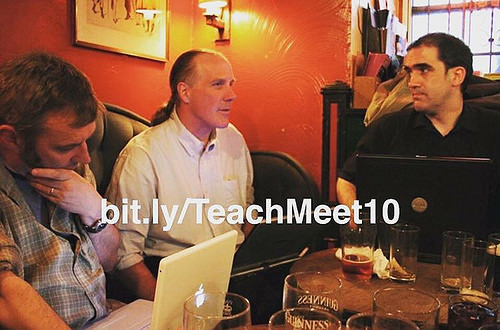 If you too have had an experience associated with TeachMeets, Ewan McIntosh is currently collecting reflections for a book celebrating the ten year anniversary on the 16th of May. TeachMeet10 by Aaron Davis is licensed under a Creative Commons Attribution-ShareAlike 4.0 International License.